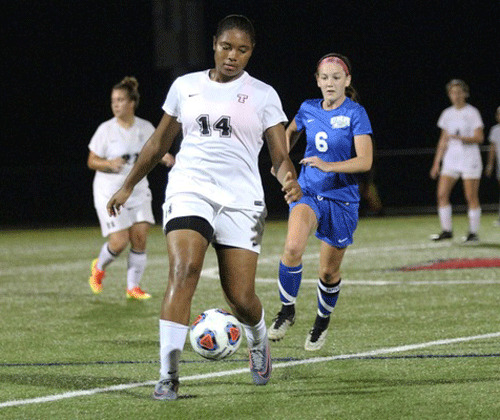 Taznae Fubler’s teammate Kayla Gordon stopped all six shots she faced for her third shutout of the season as the Thomas College Women's Soccer team defeated Northern Vermont University-Lyndon 2-0 in their North Atlantic Conference (NAC) opener. After a scoreless opening 60 minutes, Thomas College got on the board with Katherine Hoving's seventh goal of the season in the 61st minute. Julia Smith added an insurance goal three minutes later with Makenzie Carlow picking up the assist to give Thomas the 2-0 victory. Fubler had 4 shots herself during the match. Gordon picked up her third victory of the season, while Lauren Young took the loss for Lyndon.